From Nick Gold, the man behind Buena Vista Social Club comes AfroCubism, a new all-star collaboration between artists from Mali and Cuba exploring Afro-Cuban music. The album will be released on October 19 on World Circuit/Nonesuch and a special performance will take place at The Town Hall on November 9, 2010 (Buy Tickets) with Eliades Ochoa y Grupo Patria, Bassekou Kouyate, Toumani Diabaté and many others. Trailer video, more tour dates, album track listing and a press release after the jump. In 1996, a group of Mali’s best-known musicians were due to fly into Havana for a collaboration with some of Cuba’s singers and instrumentalists. However, the Malians never arrived due to travel complications, and a very different album was recorded instead: The Grammy Award–winning, multi-million-selling Buena Vista Social Club, which became the biggest-selling “world music” album ever. World Circuit Records’ Nick Gold, the man behind the 1996 venture, finally brought the original invitees together with a line-up of additional talent at a recent series of recording sessions. 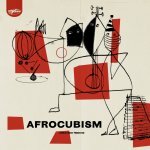 On October 19, World Circuit/Nonesuch Records will release the lost Afro-Cuban album, AfroCubism, 14 years after originally planned. Fronting the Cuban team is the cowboy-hatted singer and guitarist Eliades Ochoa, singer of the celebrated Buena Vista theme “Chan Chan.” The two original Malian invitees are multi award-winning ngoni lute master Bassekou Kouyate and the acclaimed Rail Band guitarist Djelimady Tounkara, both considered to be among the world’s great instrumentalists. 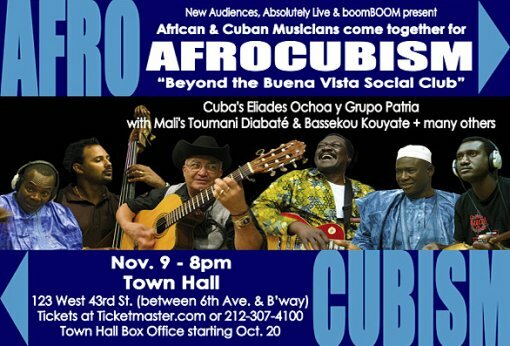 Joining them are Ochoa’s Grupo Patria, one of Cuba’s longest running and most revered bands; the Grammy Award–winning kora master Toumani Diabaté; legendary Malian griot singer Kasse Mady Diabaté; and the innovative balafon player Lassana Diabaté. Seventeen songs were recorded in five days, with all the musicians playing together live in one large room. A second session was convened some months later and produced a further nine songs.